I have a theory that male motorcyclists automatically develop an interest in vintage motorcycles the minute they get involved with motorcycling. I’m not sure why, but I think there is something genetic in our wiring that men inherit more than just the love of riding when they enter this sport. On the other hand there are parts of the sport that females inherit that we don’t such as empowerment. I have been a little more interested in vintage motorcycles of late. Especially American iron. This is a result of recent books and DVD’s coming my way for review that inspect the history of American motorcycling. The sport itself is rather young, only about a hundred years. Which company started producing motorcycles first: Harley-Davidson or Indian? Who were the founders of the Indian Motorcycle Company? What year was Indian founded? What was the original name of the Indian company? 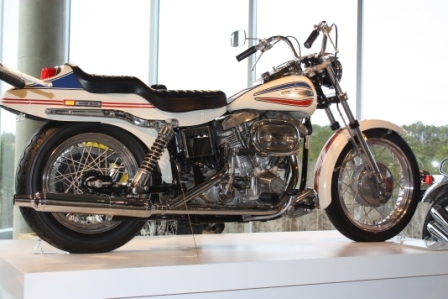 What year did Harley-Davidson start making motorcycles? What wealthy Delaware family purchased the Indian motorcycle comapany? What engine configuration is Henderson known for? What company purchased Henderson and Excelsior? 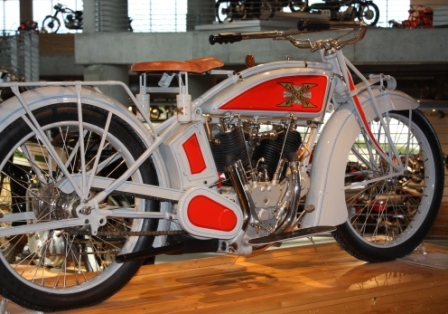 What Philadelphia motorcycle company did William Henderson help form after leaving Excelsior? How did William Henderson die? What company ceased production in 1947 after production of approximately 100 motorcycles? What brand of motorcycle was produced in Reading, Pennsylvania? What company made the first 100 mph motorcycle? What company made the De Luxe? What company made the Super X? What brand of motorcycles were imported and sold as Indians in the fifties? What brand of motorcycle is considered the holy grail by collectors and the first superbike? Who was the first man to cross the country on motorcycle? Who broke the land speed record in 1948 wearing a bathing suit? Who designed the first factory custom? What year made Hollister, CA famous for a so called riot? What 1953 movie was inspired by the events in Hollister? What organization coined the termed “1%er”? What club took their name from a Howard Hugh’s movie? Who founded the Boozfighters MC? Who founded the Oakland chapter of the Hells Angels? What four clubs are considered The Big Four?